Carlos Delgado baseball cards and autographed memorabilia often get overlooked by collectors. This is surprising given the fact that he hit 473 home runs while driving in over 1,500 runs during his 17-year career. Under-appreciated card values of a quality player often present a moderate investment opportunity. This is particularly true for players with Hall of Fame-worthy numbers. 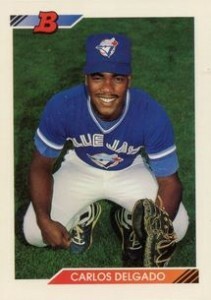 Carlos Delgado's only rookie card is in 1992 Bowman Baseball. He also has an extensive checklist of minor league cards. The most popular of these is his 1989 ProCards St. Catherines Blue Jays card. 1992 Upper Deck Minor League also has some nice minor league cards. The first Carlos Delgado certified autograph cards were included in 1992 Classic Best. This is a minor league set. They are not serial numbered and the exact print run is not known. 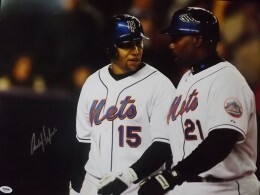 His first MLB autograph cards can be found in 1996 Leaf Signature Series. Delgado's first memorabilia cards were released by Fleer in 2000. He has a bat card in Fleer Gamers. Fleer Tradition Glossy has a Lumberjack insert that is numbered to 70. 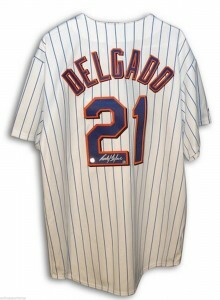 Carlos Delgado's autographed memorabilia sells for bargain prices given his career numbers. Supply is consistent with demand, which helps keep values steady. Although originally called up as a catcher, Delgado spent the majority of his fielding career at first base. Cards graded in a Gem Mint 10 by reputable companies like PSA and BGS can be found at prices that allow for an increase in value should Delgado ever be elected to the Hall of Fame. 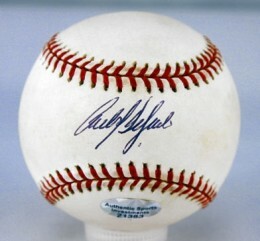 Below you will find an example of what Carlos Delgado's authentic signature looks like. This can be used as a first point of reference for determining the legitimacy of autograph memorabilia, but is not a substitute for having your items authenticated by a well-respected professional autograph authentication company. Some of the trusted sources within the sports memorabilia market include the following companies: PSA, JSA, Steiner, Mounted Memories and Tristar. Click on any of the images below to view full size photos. With a quick glance you can mistake his first name for "Rickey." Closer inspection reveals a signature that leans to the right with very narrowly spaced letters. A long, thin oval shape indicates the "C." The rest of the letters of the first name are not discernible. The "D" is just a long vertical line with no curve. The rest of the letters are also indiscernible. A difficult autograph to analyze on a letter-by-letter basis, it is recommended you compare against authenticated signatures when purchasing Delgado signed memorabilia.